Percy Jackson Cheerleaders!. 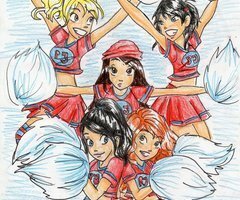 Here comes the Camp Half-Blood Cheerleaders!. Wallpaper and background images in the The Heroes of Olympus club tagged: percy jackson the heroes of olympus the lost hero new character heroes. I am so one of them! i thought it was Annabeth, Rachel, Thalia, Selina, and probably (surprising) Clarisse?